There are many ways to talk about the Hells Angels Motorcycle Club (HAMC); as a reporter illuminating the record, as an advocate praising their actions or as an undercover agent providing clear insight into the mind of a biker enterprise. Sure, not everyone agrees with the mission and tactics of law enforcement just like not everyone is going to praise OMG. It’s the way of the world. Much thanks to G. Walker (Det. Retired) who provided me a preview of the book “No Angel” by Jay Dobyns and Nils Johnson-Shelton. I wanted to pass this along because as the preview suggests, this is going to be one great read! ATF Special Agent Jay Dobyns sat with his back to me. He was furiously typing on a well-used keyboard. He wore a white wife-beater t-shirt and both his exposed arms were fully “sleeved”, or covered with tattoo work. Pulled down low over his bald skull was a dirty blue knit cap. I quietly watched him as his fingers danced over the keyboard, wondering how no one else at the outlaw motorcycle gang conference I was attending hadn’t spotted this brazen infiltrator who was even now probably sending license plate numbers and other handy information to whichever 1%er club he belonged to. It had happened before. Two full patch members of the Vagos MC had openly walked into a past OMG conference presentation, the room filled with cops and investigators. The Vagos went unnoticed for several minutes before being identified and ushered out of the hotel. Later in the conference I listened to Dobyns speak about his role in Operation Black Biscuit, a two-year ATF undercover operation against the Hells Angels Motorcycle Club in Arizona. Pacing back and forth in front of a table featuring some of the OMG props he and his ATF team of UC bikers, known as the “Solo Angels”, had used to gain introduction and then admittance into the inner sanctum of the HAMC, Jay’s rapid-fire account of the deepest UC thrust into the heart of the Angels’ organization came alive. 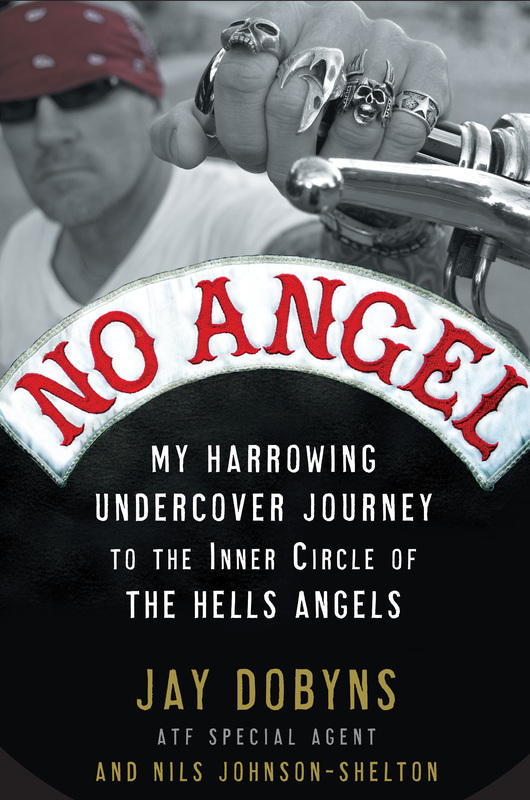 Today Jay Dobyns, in conjunction with co-author Nils Johnson-Shelton, has written the true story of both his greatest professional and near personally ruinous achievement – riding shoulder to shoulder with the Hells Angels to include the ultimate Angel himself, Ralph “Sonny” Barger. It is a book the Red & White won’t appreciate; however in all fairness, it’s also a book some in the ATF will hate with equal passion. Whether brokering deals for illegal automatic weapons, taking on murder for hire contracts, arming up to do battle with the rival Banditos on behalf of the “81”, or riding 18″ off the rear wheel of an Angel juggernaut Jay Dobyns shoves us down the slippery steep steps that lead to the glowing red inferno that is the world of the Hells Angels. In mid-2003 Operation Black Biscuit was brought to closure in a series of search warrants and arrests. The case, however, was gutted by squabbles among prosecutors and the decision makers at the ATF and by 2006 “Black Biscuit” looked more like Brier Rabbit’s badass tar baby. Earlier, in 2004, the Angels put a contract on Dobyns’ head. In 2008 his home mysteriously caught on fire and while no one was injured the implications were obvious to the man once draped with the Angel’s coveted Deathhead for “killing” a rival Mongol down Mexico way, an elaborate mock murder that brought Dobyns to the goal he’d always thought he wanted – to become a fully patched Hells Angel as an undercover ATF agent. You can advance order your copy of “No Angel” through Amazon.com. The book will be released this February. Warning! Once you’ve opened its cover and entered the world of Special Agent Jay “Bird” Dobyns there’s no putting it down. This is one 5-star weekend’s reading about the man who dared enter the innermost sanctuaries of the Hells Angels and returned with his soul singed but intact. More information available on Jay Dobyns web site. Book pre-order information from Amazon. Previous posts on 1%er bikers (1, 2, 3, 4). UPDATE: February 5, 2009 – Good interview and summary written by Leo W. Banks of the Tucson Weekly. Book cover photo used with permission.